What are the Different Audiences for My Pitch Deck? Many people think about putting together a pitch deck and don’t consider that you might be pitching to different people. Like any presentation or any document that you put together your audience is very important. Knowing who your audience is and what they care about can very much affect how you actually talk to them, or what kinds of information you share, and how you get them to make a decision, or what the next steps are in your conversation with them. The audience really strongly affects how you actually pitch and what kinds of information you put it in. It’s a really great question to ask, what are the different kinds of audiences or uses for my pitch deck? Who are the different kinds of people that might see my pitch deck, and what do they want to get out of it. First of all, very traditional audience for your pitch deck of you’re a startup company is when you’re pitching for funding. A potential investor is very common audience. Within potential investors and many different kinds of investors. We could be looking for investment from a venture capital firm, from an angel investor, maybe even from a partnership with one of your key clients, a big client or something like that, there’s a lot of different places you can look for funding or look for investment. And so each of those has their own kind of caveat to how you would put together your pitch. Another audience that’s very, very common is customers. If you’re an established company or maybe a business-to-business company then you very much might be presenting or putting together presentations or documents that you send to your potential customers. The same is true to some extent to business to consumers. But business to consumer, you’re not going to create a new presentation or a specialized presentation for each customer. It’s just too many customers. But B2B, like if you’re selling to enterprise companies, a software service product to large companies, you as the head of the small company or your sales people might be putting together a pitch or a document that you either send or present to those customers. And so that’s a really common audience as well for your pitch. Now, if you’re putting together a pitch deck for either funding or for customers, keep in mind that that same deck can be used for many different purposes, and for many different audiences that are maybe less common but are equally as supportive of your company and reaching your company’s goals. Some of the audiences to consider if you are putting together a pitch, or maybe you’re going to use that deck to present to potential co-founders, to potential new team members. You might use that pitch to pitch to potential mentors or advisers, boards of directors, people you’re inviting to your board of directors, that sort of thing. There are many different stakeholders that might find value in your pitch and in understanding your company at this sort of 30,000 foot view, which is what most pitch decks really should convey. So there’s some common stakeholders as well. I would say the big three would be the investors, customers, and then a third one is pitch competitions.  If you’re a startup that is in the startup community and there’s a lot of events going on, and you want to maybe pitch at one of these pitch competitions that’s a very common audience as well. If you haven’t heard of a pitch competition it’s an event where you can go and pitch. You spend usually about five minutes or so, give or take a couple of minutes to present your company. You might use it with a slide deck, you may not. And you pitch your company for an audience or for a panel of judges. And you’re usually doing that to either generate buzz or to get feedback. Sometimes these pitch events actually have cash prizes. So if you win the pitch company not only are you going to get buzz and feedback, but you also will get maybe some cash for your company as well, or other kinds of beneficial prizes. So pitch competition is a third common audience. When you’re putting together a pitch deck I want you to really think about these audiences. And what are the main uses of your deck. Don’t forget that you might have different versions of your deck, or at least kind of plug and play slides that you can use for difference audience groups. Because they care about different things. Your customers don’t care about your financial projections. Your investors don’t maybe care as much about a demo of the product. They really want to understand at this higher level. So you want to think about that as you’re putting together your pitches. And think about who your audience as reached, time you’re putting together a pitch, and tailor it to that use. If you’re working with a pitch deck designer make sure ahead of time you know who are the types of audiences you’re going to use it for. And make sure you work with somebody who can work with you over time. Here at Pitch Deck Fire we look at ourselves as design partners with all of our clients. We know that when you start looking for funding for example you’re going to need other things moving forward. And so we always offer an opportunity to work with us moving forward in a way that’s not available to anybody without previous clients. Because we know that you as a company, things grow and things change, and your company changes, and a lot of things may affect how you actually pitch your company and how your pitch deck should convey that information. And over time you have new audiences that you’re pitching to for new reasons, for new outcomes that you’re seeking. And those are all going to be a little bit different. And so being able to support our clients in that way helps us to give them the most effective deck possible over time. And at every point that you’re pitching you have an opportunity to pitch with the right deck, the one that is focused on that particular audience. Hopefully that answers your question here on what are the different audiences that I might be pitching to with my pitch deck. Thanks for joining us. We put out a new pitch hack every single week so give us a little thumbs up. Come back next week and you’ll find out more information that helps you and your company shine in your next pitch. If you have any comments or thoughts on different audiences, or maybe different uses that you see valuable for your pitch I’d love to hear about them in the comments below. And if you have any thoughts for upcoming pitch hacks we have a link below as well. I love to hear your thoughts and to answer your pitch hack in an upcoming video. Thanks again for joining us. I’m Stacie with Pitch Deck Fire. And I hope to see you guys here again soon. Happy pitching.